When people ask my opinions about hockey, I often say to them, “I can tell you a lot more about why the Kenora Thistles won the Stanley Cup in 1907 than I can tell you about who’s going to win it this year.” Well, with two teams remaining, I think the Penguins are going to win it this year … AND I can tell you how Pittsburgh might have won it back in 1907. The Pittsburgh Press, January 19, 1907. It will now be at least 25 years until a Canadian team follows up on Montreal’s Stanley Cup victory of 1993, but as I’ve said before in these pages, Canadian teams won the trophy all the time in the earliest days. That’s because when Lord Stanley donated his Cup in 1893, he intended it to be awarded to the championship team in the Dominion of Canada. Lord Stanley made no stipulation about amateur teams – although it’s unlikely he ever gave much thought to professionalism, which had became a pretty hot topic in Canada by the 1906-07 hockey season. Many Canadians felt sports should only be played for the glory of the competition and were against paying the players. In the late fall of 1906, when some of the top teams and leagues in Canada announced they would allow professionals to participate – including the Stanley Cup-champion Montreal Wanderers – there were those who expected the trustees in charge of the Stanley Cup to take back the trophy. They didn’t, and since the winter of 1906-07, the Stanley Cup has been a professional trophy. The Pittsburgh Press, January 20, 1907. Beginning in 1904-05, the Pittsburgh Professional Hockey Club played in the International Hockey League. Usually known as the Pittsburgh Professionals or the Pittsburgh Pros (and often Pittsburg without the ‘h’ as the city name was actually spelled from 1816 to 1916), they played against the Portage Lake team from Houghton in Michigan’s Upper Peninsula, Calumet, Michigan, and teams from both Sault Ste. Marie, Michigan and Sault Ste. Marie, Ontario. The Pittsburgh Press and the Pittsburgh Daily Post, February 3, 1907. But bar them they did. The Pittsburgh Press, February 17, 1907. That still seems to be true for a lot of Canadians today, and yet there’s something odd about Ross’s refusal in 1907. It had been reported in a much shorter story in the Globe in Toronto two days before the Pittsburgh report – but I haven’t been able to find it in any other Canadian paper. That includes the Ottawa Journal, which was owned and published by Philip Dansken Ross himself. The Globe, Toronto. February 15, 1907. In addition, both stories say that the American teams would be barred from challenging, but that the Canadian Soo would be eligible if they won the International league title. While they were obviously a Canadian-based team, P.D. 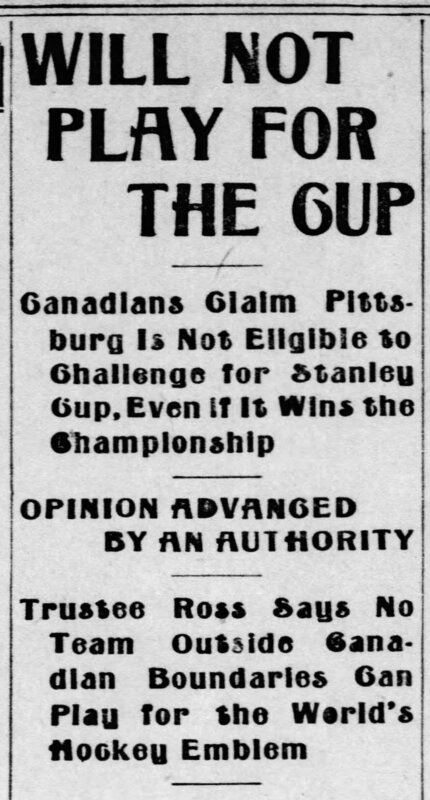 Ross would have known better than anyone that if the Canadian Soo won the Cup, that would have automatically made the other American teams in the International league eligible for it. That’s because in addition to challenge matches, the Stanley Cup would also change hands if a new team won the league title in the same league as the defending champions. In the end, Pittsburgh lost the IHL title to Portage Lake in 1906-07, so couldn’t have challenged anyway. Still, it’s fair to wonder if the Stanley Cup trustees really issued the ruling credited to them at the time … even though it took them until early in the 1915-16 season to finally declare that U.S.-based teams could compete for the Stanley Cup. Despite the nearly quarter-century drought these days, it was probably the right decision! Wow! I was totally unaware of this! Great job Eric! Thanks for the great update on Pittsburg(h). If we didn’t have the Stanley Cup, there would probably be an overall trophy for North American professional hegemony anyway. So just as well we had a trophy ready made for it, which could give it a long history and tradition. It is kind of odd though, when you trace the cup’s history, that it went from being the top amateur trophy for all amateur leagues in Canada, to the top professional trophy, for only one professional league in North America. Is Lord Stanley writhing? Probably not. I did quite a bit of research on the old IHL, but was limited re all the details about the local angle of looking at things. P.S. Like you, I know more about historical teams than current ones. For one thing, in the good old days there was much more ‘behind the scenes’ data printed for the public than now. I read about current players who keep their mates in stitches…..but nary an example of how they are funny guys. No stories like the ones about Clancy and peers. Mr. Ross was looking at who could compete for the Stanley Cup thru the same lens as the umpire who said, “Some’s balls and some’s strikes, but they ain’t nothin’ till I calls ‘em.” As one of the trustees with ultimate authority, he could simply call ’em as he saw ’em…and it was going to be a Canadian-based team who he allowed to play for the Cup. Got to love the simplicity of it all. Thanks once again for sharing another historical glimpse. What a great article Eric….I was watching an old “Murdoch Mystery” that dealt with hockey in early 1900’s. They were aghast at the concept of men getting paid to play a game of hockey. And look where we are now in 2017….bet that would turn those peoples’ heads for sure. Congrats on the e copy of your story in N.Y. Times!! I am so happy for you! You’ve worked hard for many years & it is great you made the ‘big time’ finally!